Everything’s coming up delicious! 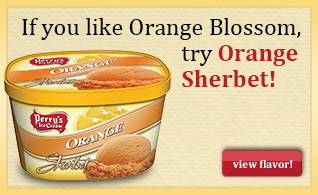 You’ll love this combination of vanilla ice cream and orange sherbet. 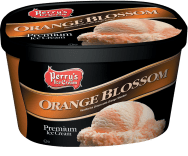 MILK, LIQUID SUGAR, CREAM, CORN SYRUP, SKIM MILK, BUTTERMILK, WATER, MILKFAT, WHEY, ORANGE PUREE (WATER, ORANGE PULP, CONCENTRATED ORANGE JUICE, HIGH FRUCTOSE CORN SYRUP, NATURAL FLAVORS, CITRIC ACID), CITRIC ACID, VANILLA EXTRACT, MONO- AND DIGLYCERIDES, METHYL CELLULOSE, GUAR GUM, CELLULOSE GUM, CARRAGEENAN, LOCUST BEAN GUM, DEXTROSE, YELLOW 5, YELLOW 6, RED 40, ANNATTO COLOR.